For my first trip of the season, July 4-10, much later than recent years, I headed in at the Five Lakes trailhead and went down Five Lakes Creek. There were only snow patches on the trails, and they would be gone by now. There are a few trees down as far as Whiskey Creek Camp, and a moderate amount of winter debris, the branches that come down over the winter and can be throw off if one has the time. From Whiskey Creek Camp southward, there are more trees and more debris, with the biggest issue being young firs bent over the trail. More snow than usual at these middle elevations bent these trees. From Diamond Crossing south to Steamboat Creek, there are a lot of trees down, and a lot of winter debris. In fact, this trail segment has become quite difficult to follow. When you leave the trail to go above or below a fallen tree, it is very challenging to see the trail and get back on it, being so covered with debris that it looks just like the rest of the forest floor. If this trail doesn’t receive some maintenance within a couple of years, it is done for. Bears provide a lot of the trail maintenance on these lesser-used trails, and there is evidence that the bears are starting to prefer other, easier routes over the old trail, and if so, that is the beginning of the end. All of the named creek crossings were wet ones. Some are probably rock jumps now, but some may still be wet. The snow melt has created tread erosion in a number of places. No surprise. When you combine an almost complete lack of water control structures on the trails with a wetter winter, erosion is the result. I spent two days doing maintenance on the lower third of the Powderhorn Trail. The doghair fir is pushing into the trail, so the hiker has to push through it. I cut those back, so the trail is in good condition, with a bypass around one down tree. However, another down tree that can be bypassed by hikers may well be a barrier for equestrians since it is on a steep side slope in a dense forest. The real issues on the Powderhorn are in the middle third section, where doghair fir and whitethorn brush have essentially closed the trail. Though the alder section below the postpile formation has been an issue in the past, I’m guessing that it is still passable. I did not have time to work on the middle third, so good luck if you go there. I met a Forest Service wilderness ranger, Nathaniel, on the Five Lakes trail. This is the first time in many years that the Granite Chief has had dedicated staff, so I’m looking forward to more attention being paid. The flower show is just developing, with pentstemons, mules ears,and a few others. I did not go north or south on the PCT, nor any of the other trails in the wilderness, so have nothing to report on them. As always, I welcome comments from others on trail conditions, creek crossings, and water sources. 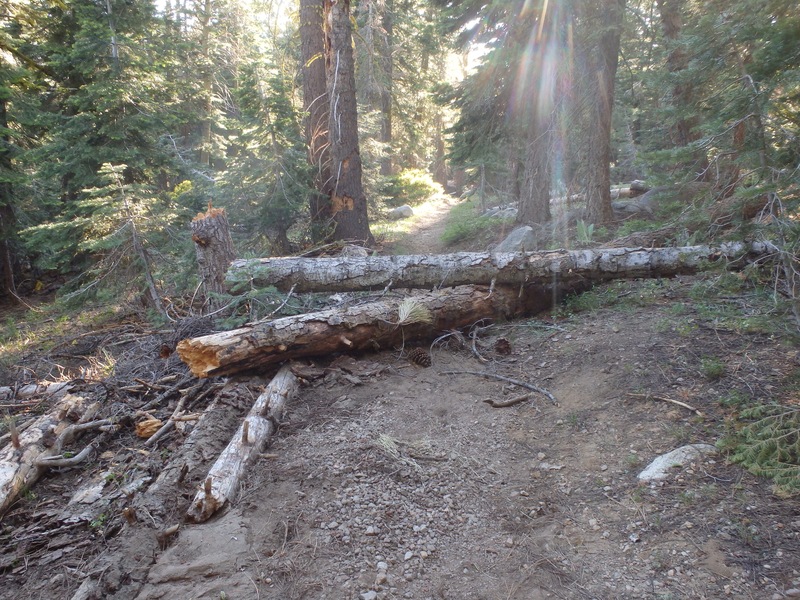 This entry was posted in Trip Reports and tagged brush, down trees, Five Lakes Creek Trail, Hell Hole Trail, Powderhorn Trail, tread erosion, winter debris on 2017-07-22 Saturday by Dan Allison. Thanks for the report. I noticed in your Flickr album the picture of the disgusting camp left in Big Spring meadow. Is that from hunters…or from other more nefarious activities? I don’t know. It looks like a single individual who was there for some while, and then left suddenly.